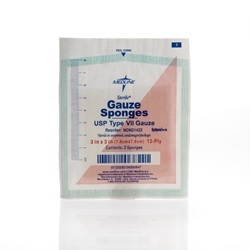 Sterile gauze sponge measures 3" x 3" and is made from 12 ply cotton. Latex free. Manufactured by Medline. Comes 2 per pack and 40 packs per box. 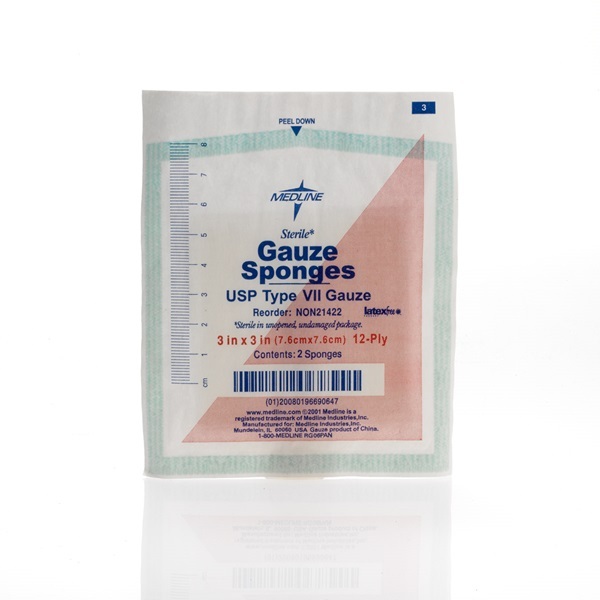 These USP Type VII cotton sponges are ideal for wound dressings, wound packing and general wound care. Our strictly controlled manufacturing process assures clean,debris-free packing with folded edges to prevent unraveling. Sterile 2's are packed in a coated paper envelope to reduce fiber debris. This easy-open envelope is also carefully sealed to prevent the intrusion of dust and contaminants.